How do I view the program files and get them to my robot? then the Download link will download a compressed folder (.zip file) containing the program file(s) for the project. Your computer must be able to read zip files to read these. Most newer computers can read and open zip files directly, and you will be able to see the files inside after downloading it and selecting "Open" when prompted for what to do with the file. On some computers, you may need to download and install an "unzip" utility (many are available for free). On some systems, you may need to save the .zip file to a location on your computer before opening/unzipping it if it will not open directly. Alternately, if the project instructions link directly to a program file in the description such as the Power_Saw program, then the program file is uncompressed and will download directly. 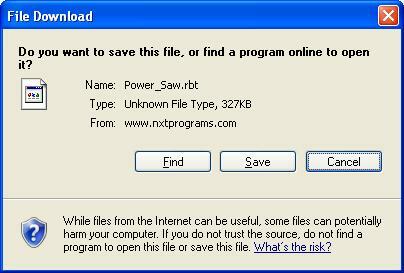 Once you reach an NXT program file (.rbt), you can either save it to a location on your computer, or open it directly. 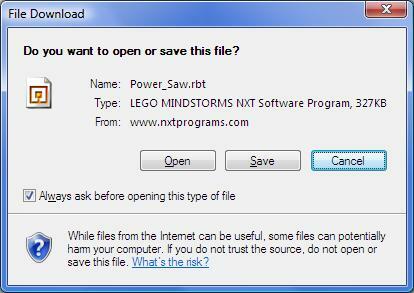 In either case, you will need the LEGO MINDSTORMS NXT software installed to read it (see below). The downloadable programs for the projects (.rbt files) are written using the NXT-G programming system, which requires the LEGO MINDSTORMS NXT software to be installed in order to view them, edit them, or download them to the NXT brick. The program files cannot be used with RoboLab or any of the other NXT programming systems, not can they be viewed in standard text/graphics programs such as Microsoft Word or Adobe Reader. Note: The NXT 2.0 projects require the NXT 2.0 version of the software, which comes with the 8547 set. If you are using the LEGO Education software, the LEGO Education NXT-G 2.1 software is required to use any programs that use the color sensor or the Pack-and-Go (.rbtx) format, otherwise the LEGO Education NXT-G 2.0 software will work with most 2.0 programs. The NXT 1.0 projects will load and run in any version of the NXT software. If you have the LEGO MINDSTORMS NXT software installed, then a program file (.rbt) will automatically load into the NXT-G programming system when you open the file. (this example alert is from Microsoft Windows XP). (this example alert is from Microsoft Windows Vista). Press the Open button to load the program into the NXT-G programming system. After the program file loads into the NXT-G programming system, you download it to the robot by connecting the USB cable to the NXT brick and pressing the Download button on the controller in the lower right corner of the NXT-G window. All of the program (.rbt) files on nxtprograms.com should load, compile and upload to your NXT through the standard NXT software without any additional software, if you have a suitable version of the NXT software installed, as explained in the Required Software section above. If you are getting "Error 5002" or "The program is broken. It may be missing required files", you are most likely trying to load an NXT 2.0 program into the NXT 1.X or other older version of the software. If you have the correct NXT software installed but you still get an error trying to load or compile a downloaded program such as "Invalid program file", or "Internal Compiler Error", it is possible that the file was not downloaded completely by your browser or was corrupted. The .rbt files are large and may fail to download completely in some cases. If this happens, try downloading the program again. The retail versions of the NXT kits (The original 8527 and the NXT 2.0 8547) come with the NXT software CD. If you lost your CD, you can contact LEGO Technical Support to get a replacement. The NXT 2.0 software can read and use all programs written for NXT 1.X, so if you have the NXT 2.0, you will also be able to load the programs from the NXT 1.X projects and possibly adapt them a similar robot of your own design. The NXT 1.X software cannot in general use programs written for NXT 2.0. You will usually be able to load them and examine them, but some blocks may not display properly. Some very simple NXT 2.0 programs can be downloaded to a 1.X NXT, but in general you will not be able to use them. The NXT software for the Education version of the NXT (9797) is sold separately here at LEGO Education and contains different help material and building instructions from the retail version of the software, although either version of the software can be used to write programs for either NXT kit. For the NXT 2.0 projects on this site, the LEGO Education NXT-G 2.1 software is required to use any programs that use the color sensor or the Pack-and-Go (.rbtx) format, otherwise the LEGO Education NXT-G 2.0 software will work with most 2.0 programs.